The land on which Nundoobah Retreat is built was originally inhabited by the Aboriginal tribe of the Biripi. For many years the Biripi people lived on seafood and the fruits of the magnificent rainforests that occupied the coastal plains of the Manning Valley. The name Taree is actually based on the Aboriginal word “Tareebit” meaning “fruit of the wild fig”. The name Nundoobah means “place of the grass tree”. The significance of the Aboriginal heritage has not been lost. 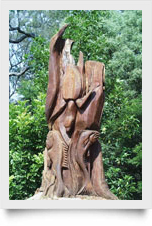 With the help of local Aboriginal artist Russell Saunders, Nundoobah Retreat is home to several magnificent carvings, reflecting different aspects of the Aboriginal culture and “The Dreaming”. The cottages have each been artistically decorated with Aboriginal sculptures, boomerangs, spears & paintings. Just wandering about the property you will experience a sense of awe at the magnificent history associated with this place. Biripi artist Russell Saunders and his daughter Rachel operate out of “Deep Water Shark Gallery” in nearby Tinonee, where a wide range of works is displayed.